— who quite possibly inspired more American teenagers to become radio disc jockeys than anyone else, as his highly rated, highly entertaining, highly energetic WLS nighttime show reached impressionable youngsters in 37 states. John and I started chatting, and suddenly it occurred to me that you might find his thoughts on radio — today, yesterday and tomorrow — Well, maybe you’ll find them interesting. Excellent Landecker interview – don’t spend tooo much time on Facebook and Twitter – focus on the product. Your product. Thanks for posting the interview. This is something that everyone can learn from. I think the key to Mr. Landecker’s message is PASSION! If you’re passionate about radio as a career you’ll make it happen. If not, there are plenty of other careers available. AWESOME!! Boogie Check! Thanks for sharing this Dan-O! Unfortunately, the kids getting into the biz are too young to have heard the magic of guys like John back in the glory days of LS. Just really nice to see John. Drive and passion, kids. Great interview! John Records Landecker was my inspiration for a radio career. I grew up in Iowa and could barely pick up WLS in Chicago but I’d get out of school and listen every afternoon even with all the static. John is the reason I’ve been on the air for the last 31 years…..and I still think I’m his biggest fan! So very cool! 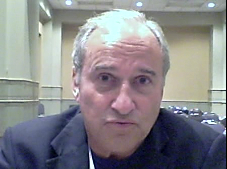 John Recods Landecker was/is such an icon here in Chicago along with Larry Lujak and Steve Dahl. Love catching him when I can–Seriously– we get all excited when we find him on the radio. Amazing staying power, you know? Excellent posting! What John says about ‘passion’ is true whether applied to radio broadcasting or any other pursuit. You’ve got to know ‘why’ you want to do it! And his advice on the importances of ‘content’ is very relavent. Old media-new media… you’ve got to give your intended audience a reason to listen or to log on and download. John brings up an interesting point. My new responsibilities here at my group has been to explore and implement social media as part of our regular programming efforts, and I’m quickly coming to the same conclusion: When it comes to “new media” we’ve been doing it backwards. Instead of driving users to our webpages, facebooks, and twitters, we should be using these tools to drive users to our primary product – our shows and on air content. Constantly driving people to these collateral sites is the equivalent to using a motion picture to drive viewers to watch the trailer. I was so excited, I mis-typed. It should have read “Among my new responsibilities here…” Damned passion gettin’ in the way again. Landecker was an influence in my “early radio years” he was so good on 89 WLS, as was from Lujack to Fred Winston. I remember when he ‘Landed’ at 680 CFTR in Toronto to do Mornings….The T.dot crowd never took to John’s style, sad…numbers were weak and he went back to Chicagoland. I was a pre-teenager listening to John do “Boogie Check” on WLS. Then, maybe 15 years later, I got to work with him as his news anchor and as a production guy at WJMK. I was terrified of that development. He was (and still is) my radio idol. Unjustly terrified. Completely unjustified. JRL is, regardless of market size, not only a talent of utter integrity, but perhaps the nicest guy in radio. It’s a lesson I will never forget. My daily listening in the Windy City (WLS, WCFL) ended in 1970, but I used to catch John “Records” Landecker when visiting. It’s a shame that bits like his “Boogie Check” are found these days only in old airchecks. As you know it was a great place to grow up. I still have a animal Stories LP. That commitment that you are talking about is long gone by newer talent. I once heard Carlton Fisk say how the players used to sit around after the game and talk about the game, but that doesn’t any more. The reason you don’t see the committment from newer talent these days is because they don’t have a real stake in the action. Most radio stations aren’t run by broadcasters anymore. They’re owned and operated by corporate ‘yes men’. How can anyone who loves radio have anything significant in common with people such as these? Great advice from the man who saved my life. Born in Chicago, we moved to the God-forsaken hinterlands of Michigan’s Upper Peninula when I was 12. Thankfully, when the sun went down, I could tune in to WLS and hear that life as I had known it still went on. Thanks to John (the boy in the box who is I) for being such an inspiration, and to Dan for posting the interview. Oh, to have been a fly on THAT wall. Telling it like it is..>> The way it was back then..I always called it ”Do Or Die ” … It’s got to be in your BLOOD….Thanks John for the insite !